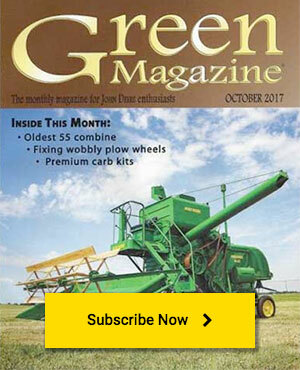 Recently on the internet there have been multiple folks with questions about removing their John Deere New Generation fuel tank to fix a leak, or to access a steering motor oil line that is leaking. For tractors that didn’t get a good pressure washing to clean out the dirt that seems to accumulate around the bottom of the steel fuel tank, these tanks, or the steel fuel line that goes from the bottom of the fuel tank to the fuel pump tend to rust through from damp soil sitting in contact with these parts. How common is this issue a person may ask? Try going to a salvage yard and find a good New Gen fuel tank some time. With the New Generation fuel tanks at 50 plus years old, plenty of time has passed for the soil acid and moisture to rust through these mild steel components. Such is the case with my wife’s 4010. She has owned the tractor for 20 years now and it is always parked in the machine shed. But alas, last week one day when I walked into the machine shed I could smell gasoline, and a quick look around showed that the concrete floor was damp with gasoline between the front tires. A closer inspection showed the leak appeared to be coming from the steel fuel line that connects to the shut off valve at the bottom of the fuel tank, and runs to the fuel pump. This fuel line runs under the fuel tank support plate, and this support plate also covers the hydraulic pump, and also supports the hydraulic oil cooler. For those who are familiar with the bottom side of a New Gen fuel tank, working up in there is pretty much impossible, so to make life easier the fuel tank needs to come out so the fuel line can be replaced. For experienced New Gen mechanics this will be a simple procedure, but there is always someone who is attempting this task for the first time, as indicated by the recent chatter on the internet. To keep our hobby alive and flourishing we need new collectors/enthusiasts to get interested in this wonderful iron that the rest of us enjoy. By covering some of these basic repairs we can remove the mystery factor for many. By removing the mystery factor about some of these repairs, new comers may gain the confidence to buy that first tractor and join the rest of us who have already found the great fun that comes with this treasured iron. So let’s get started. We will assume you have already removed the rear engine side panels, and the radiator side screens. The cowl in front of the dash will come off first followed by taking off the radiator cap, fuel tank cap, unbolting the rear hood bolts, turning the front hood latches out, and removing the hood. Life will go a lot easier if you remove the muffler before trying to remove the hood. If your tractor is equipped with a pre-cleaner and bowl, you can remove this by gently tapping on the bottom of the metal pre-cleaner housing where it slips over the intake stack, it is just a press fit over the air stack tube. With the hood off, the front side panels will come off next to expose the fuel tank. At the top of the front side panel, there is a 3/8” carriage bolt that needs to be removed, followed by removing the nut from the 3/8” carriage bolt at the bottom of the side panel. There is no need to worry about the side panel falling off and getting damaged once these nuts and bolts are removed. At the front of this side panel are three spring clips still holding the side panel in place. Gently tap the side panel forward to release it from these spring clips. The lower 3/8” carriage bolt sits in a groove with the threads facing up and it is a good idea to remove these bolts and clean the rust off them, or replace them with new carriage bolts. Under the fuel tank is a hand shut off valve that the fuel line connects to. If your fuel tank is almost empty you can close this valve to save whatever fuel is still in the tank, or I prefer to use an electric external pump to pump the fuel tank dry. You can remove the fuel line from the shut off valve at this time using a line wrench. It is best not to try loosening this line with just an open end wrench because in most cases you will only succeed in rounding off the corners of the line fitting, use a 6 point line wrench. Before we get too far into our project of removing this fuel tank we need to take a moment and mark the location of the fuel tank as it sits in the tractor. If we don’t mark how the fuel tank is sitting in the tractor before we remove the tank, it’s almost certain that the fuel tank filler neck will not line up with the hole in the hood when we try to put the hood back on at the end of our project. An easy way to mark the tank location is to use a straight edge off the front edge of the tractor frame rail and draw a line on the fuel tank as a reference when we put the tank back in. On the right side of the fuel tank you will find two fuel tank strap nuts. These nuts have a nasty habit of being rusted in place causing a person to twist off the strap stud. If you twist off the strap stud, you will have to buy a replacement fuel tank strap. To try and get these strap nuts off successfully liberally apply a good penetrating oil. If there are any exposed threads for the strap stud like we see in, run a thread chaser, or thread die over the stud threads to remove any rust or paint. Remove the tank strap nuts for both tank straps. Also remove the wire going to the fuel tank sending unit at this time. If the sending unit has a separate ground wire like the white wire in, remove that also. The top fuel tank strap has two brackets, one on each side of the tractor where the radiator support rods attach. The left side radiator support rod is easily removed by loosening the front nut, then lifting the threaded part of the rod out of the bracket. While you are working by the air cleaner removing the radiator support rod, prop the air cleaner up so it doesn’t fall when both tank straps are removed. By only loosening one of the nuts on the radiator support rod, when we re-install the support rods it will position the fuel tank correctly for the filler neck to line up with the hole in the hood. Make a mental note to yourself that the top tank strap also has a hole at the front of the strap that must also line up with a locating tab at the front of the tractor. Removing the right side radiator support rod is a little more work than the left side. There are two brackets holding hydraulic lines in place, and the right side radiator support rod passes through these brackets. You have to loosen these brackets enough for the radiator support rod to be lifted free from the fuel tank strap bracket. With the radiator support rods free from the top fuel tank strap, the air cleaner can be disconnected from the rubber intake tube that goes over the top of the radiator, and removed. If your fuel tank has a vent line attached to the top of the fuel tank, remove the line and bend it up slightly. The fuel tank can now be lifted out the left side of the tractor. Once the tank is out, inspect it closely where the bottom of the tank sits in the tractor, and where the tank straps clamp around the tank for signs of rust pitting. Now is also a good time to replace the hand shut off valve. The reason we needed to remove the fuel tank to replace the fuel line between the fuel tank and the fuel pump, is because this fuel line passes under the fuel tank support plate. This is the only way I have found too quickly, and successfully thread this fuel line under the tank support plate. 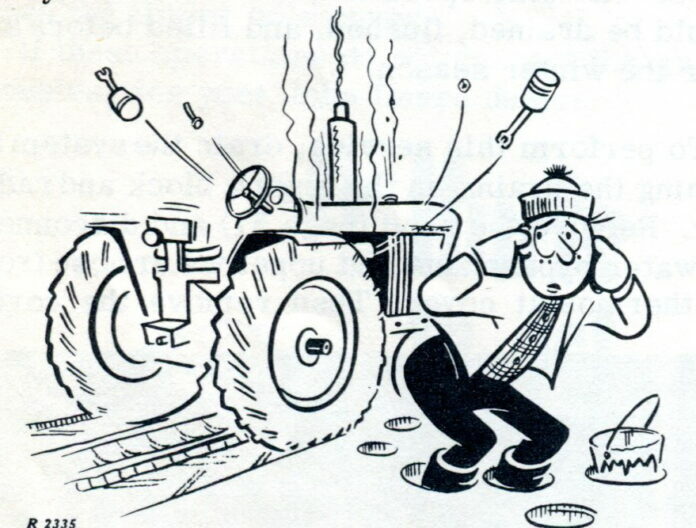 It works best if you pull the old line out towards the fuel pump, or towards the rear of the tractor. There will be plenty of dirt and gunk under the fuel tank support plate that a person should try to remove as much of it as possible. When threading the new fuel line under the support plate, again it will work best to thread it in from the fuel pump toward the front of the tractor. Keep the end of the fuel line capped to prevent dirt from getting in the fuel line. As we can see in the new fuel line is in place and we have attached foam to the tank support to prevent vibration chafing on the bottom of the fuel tank. Well, as the I&T manual says, just reverse these steps and you’re done. Since we aren’t the I&T manual we’ll just briefly cover a few points to make sure the project goes smoothly. If you do find a fuel tank that has some fairly deep pitting where it sits on the tank support, or where the tank straps clamp around the tank there are basically three options. One is to just put the tank back in the tractor if it wasn’t leaking before, a second option is to find a good salvaged tank, and the third option is to put in an aftermarket poly tank that is available from several suppliers. Before setting the fuel tank back in the tractor, put the lower fuel tank strap in place. It is quite difficult to get the lower strap in place once the fuel tank is sitting in the tractor. If you replaced the shut off valve in the bottom of the tank, getting the new valve positioned correctly to connect the new fuel line can be a bit of a challenge. To help make this as painless as possible it will be helpful to get the fuel line connected to the shut off valve before the fuel tank is fastened in place. 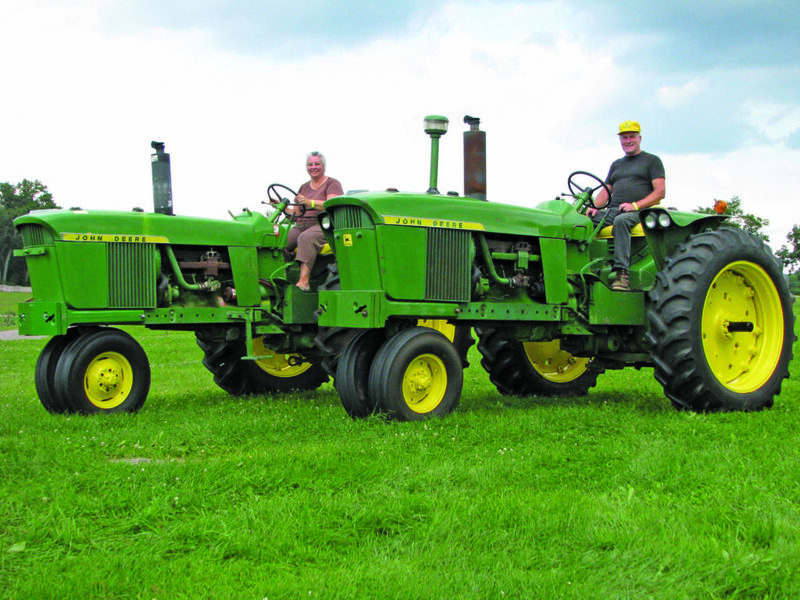 Without having the fuel tank fastened to the tractor you can move the tank slightly until the shut off valve and fuel line are positioned so you can get at least two complete threaded turns of the line nut by hand. The last thing you want at this point is to cross thread your new shut valve or new fuel line. If you try connecting the new fuel line with the tank fastened to the tractor, it will be very difficult to get the line fitting to thread correctly on the shut off valve. With your fuel line attached to the shut off valve, and to the fuel pump, you can line up the marks you made on the fuel tank with the front edge of the tractor frame rails. If you are installing a different fuel tank you will want to leave the fuel tank straps loose until the hood is put back on so you can line the tank filler neck up with the hole in the hood. The challenge here is with tractors that have an air intake pre-cleaner stack because the fuel tank filler neck must line up with the hole in the hood as well as the pre-cleaner stack lining up with that hole in the hood. Once you have the filler neck and pre-cleaner stack correctly lined up with the holes in the hood, you can tighten the fuel tank straps. Okay, we just got ahead of ourselves. Since we just ahead of ourselves let’s back up a bit, with the fuel tank in place we can go ahead and loosely position both tank straps. Only thread the strap nuts onto the strap stud about two turns. This will leave the straps loose enough to get the air cleaner bracket slid in place under the tank straps, and to put the radiator support rods back in place. Having a helper hold the air cleaner in place, or propping the air clean up in position is helpful until the tank straps are tightened. Remember on the right side to reinstall the hydraulic line clamps once the radiator support rod is positioned. Your tank vent line can now be reinstalled. The fuel gauge sending wire can be reattached along with the sending unit ground wire. Now would also be a good time to reinstall the rubber air intake tube that goes over the top of the radiator. If you are replacing the fuel gauge sending unit, the bolt pattern for the sender and fuel tank will only go together one way. The bolt pattern is not symmetrical. Moving forward, we can reattach the front side panels by first sliding the front edge of the side panel under the three retaining clips, then secure the carriage bolts and nuts. For tractors equipped with an oil bath air cleaner, no matter if you have a pre-cleaner stack or not, make sure the cone shaped deflector for the intake tube is 100% clean. It is quite common to find this area nearly blocked completely with a mixture of dirt and oil fumes. With our fuel tank secured, radiator support rods secured, vent line in place, filler neck and pre-cleaner stack lined up with the hood holes, intake tube in place, and front side panels attached we are ready to put the hood back on. With the hood on, look at the gap between the hood and the front side panels. To make this gap look even, you may have to loosen the two side panel retaining nuts and tilt the side panel forward or backward to get the gap even. Once the gap is even, tighten the retaining nuts. After the radiator screens are reattached, the dash cowl installed, and muffler back on we are ready to go have some fun. Take the time to encourage someone new to start enjoying this wonderful part of our agricultural heritage.